Pressure Regulator - What Is It? 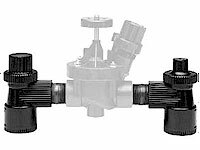 Pressure regulators are used to regulate the amount of incoming water pressure entering your sprinkler system to the recommended operating pressure of the drip or micro irrigation system. Pressure Regulator - Why Do I Need It? 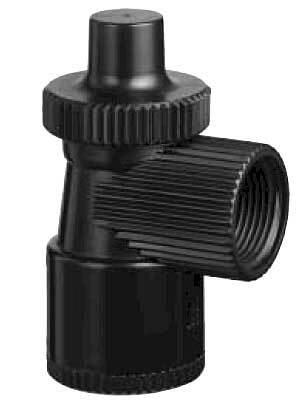 A regulator is needed to keep the water pressure in the sprinkler system regulated. If the water pressure becomes too great, it could damage the sprinkler system and create leaks or connections in the system that may fail. The PR7000 Pressure Regulator uses a 150 mesh stainless steel screen filter to prevent contamination of both valves and emitters and is able to withstand line pressure up to 150 PSI. 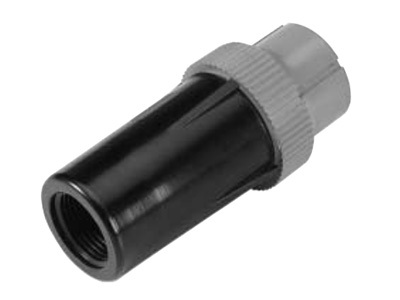 The filter is easily accessed for cleaning through the top cap. 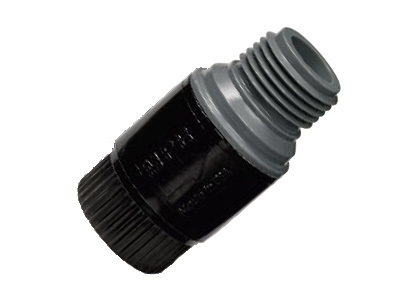 The pressure can be changed by simply removing the top cap and changing the spring. 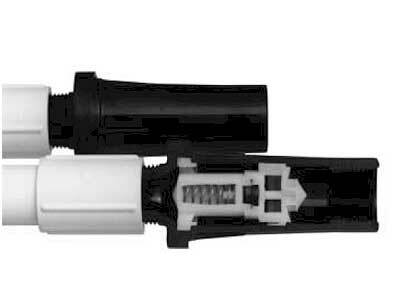 The springs are available in six pressure settings: 10, 15, 20, 25, 30, and 35 PSI. For quality, convenience and durability, the new 7000 Screen and PR7000 regulator from Hendrickson Bros. set the standard for professional drip irrigation manifolds and pressure regulators. Details: The new PRC4500 Series Preset Pressure Regulator is a 1/2" low flow pressure regulator with a built in check valve. It will prevent line drainage from causing unwanted erosion and water puddles. This regulator works by remaining closed with no flow until the check valve opens. After opening, the sprinkler or watering system will operate at the selected preset pressure. Upon system shut down, the flow of water will stop when the inlet pressure drops below the preset pressure. For seedbed irrigation where sprinkler erosion is a problem. Available in 3 pressures: 20, 30 and 40. Details: The PR8000 PRESET PRESSURE REGULATOR is a high flow regulator that has a range of 1 to 35 gpm. 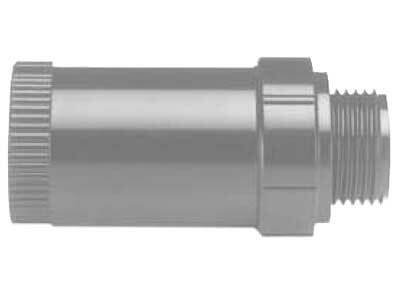 This regulator has been designed to convert high pressure to the desired pressure. The PR8000 is specifically designed for use in high flow applications such as agriculture, greenhouse, nursery and landscape. Wide range of flows 1 – 35 gpm. 10, 20, 25, 30, 35, 40, and 50 psi preset pressures available. High Quality, High Strength ABS plastic construction. Details: A proven preset pressure regulator designed specifically for low flow drip irrigation applications, in 6 popular pressures. Details: The PR5500 offers exceptional outlet pressure control to provide consistent performance from 20 to 720 gallons per hour. The PR5500 offers the widest operation range available. The PR5500 effectively regulates at the following pressures: 10, 15, 20, 25, 30, 35, and 50 PSI, all preset to exacting factory specifications. 10, 15, 20, 25, 30, 35 and 50 PSI preset pressures available. Details: The PR5500A offers exceptional outlet pressure control to provide consistent performance from 20 to 720 gallons per hour. The PR5500A offers the widest operation range available. The PR5500A effectively regulates at the following pressures: 10, 15, 20, 25, 30, 35, and 50 PSI, all preset to exacting factory specifications. 1/3 to 12 GPM (20 to 720 gallons per hour). Details: The PR5500PP offers exceptional outlet pressure control to provide consistent performance from 0 to 720 gallons per hour. The PR5500PP effectively regulates at the following pressures: 10, 20, 30, 40 and 50 PSI, all preset to exacting factory specifications. 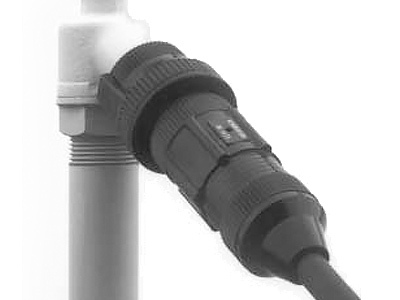 Holds outlet pressure to no more than 7 PSI above preset pressure during static (no flow) conditions. Wide range of operation 0 to 12 GPM (0 to 720 gallons per hour). 10, 20, 30, 40 and 50 PSI preset pressures available. Details: The PR5800 offers exceptional outlet pressure control to provide consistent performance from 1/2 to 12 gallons per minute. The PR5800 offers the widest operation range available. The PR5800 effectively regulates at the following pressures: 10, 15, 20, 25, 30, 35, 40, and 50 PSI, all preset to exacting factory specifications. 10, 15, 20, 25, 30, 35,40 and 50 PSI preset pressures available. Details: The DG6000 Pre-Set Pressure Regulator is ideal for balancing pressures throughout any medium-flow irrigation system. It is also used for controlling the output of sprays and sprinklers on center pivot and lateral move irrigation systems. The DG6000 is presently available with regulated output pressures of approximately 10, 15, 22 and 35 PSI for flow ranges from .5 GPM to 15 GPM under normal conditions. Details: The PR7000 PRESET PRESSURE REGULATOR is a high flow regulator that has a range of 10 to 35 gpm*. 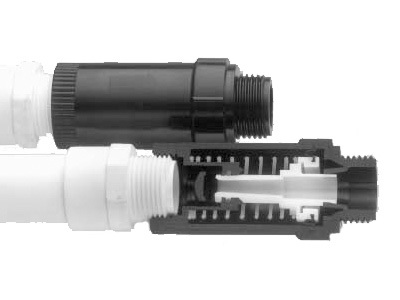 This unique regulator comes in a 90° angle configuration with a 1" FPT on both inlet and outlet. Wide range of flows 1–35 gpm. 10, 15, 20, 25, 30 and 35 psi preset pressures available. High Strength ABS plastic construction. Details: The PR7500 PRESET PRESSURE REGULATOR is a high flow regulator that regulates to outlet pressures of 50 to 80 PSI and has a flow range of 1 to 35 GPM*. 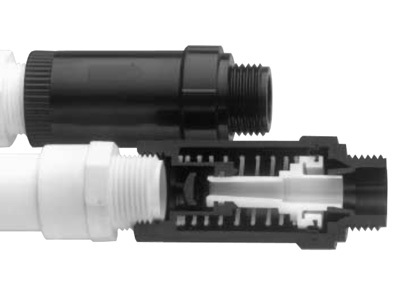 This unique regulator comes in a 90" angle configuration with a 1" Female Pipe Thread on both the inlet and outlet. 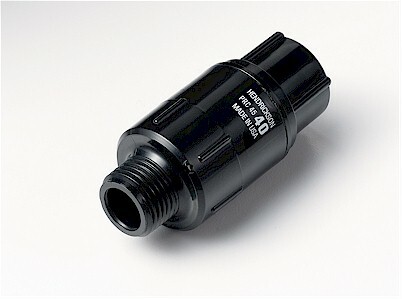 Regulates to outlet pressures of 50 to 80 PSI. Details: Retrofit existing sprinkler to water saving drip or sprayer systems. The MPR converts standard sprays and bubblers to low water conserving micro irrigation. 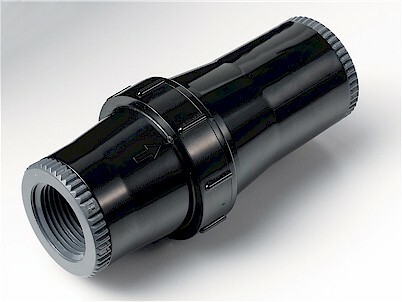 The MPR can be installed on a 1/2” riser or a fitting with 1/2” pipe thread. 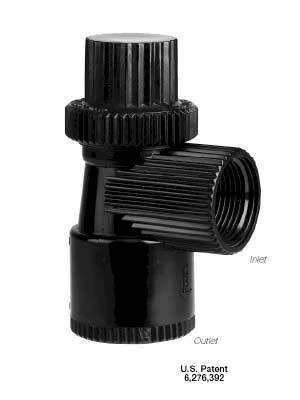 It has female pipe thread on the inlet and male pipe thread on the outlet. It is pre-set to 20 or 30 psi, no other adjustment is necessary. A separate pressure regulator is not necessary. It has a built in check valve and will be off til 25 PSI and then it regulates to set pressure. When shutting down it will shut off at 10 PSI. It is ideal for planters, patios, hanging plants or other areas with shrubs, trees or ground cover.